Lower your debt, boost your monthly cash flow, and be mortgage-free faster. If you’re carrying high-interest credit card debt that has caused your cash flow to slow to a trickle, you owe it to your financial future to have a conversation about how you can roll that debt into your mortgage so you can save – sometimes thousands in interest – and start building wealth. Worried about penalties? Don’t think it can make much difference? Think again. Using today’s historically low mortgage rates, you have a golden opportunity to give yourself a tremendous financial boost. By using your home equity to consolidate your debt, you can improve monthly cash flow, have one easy payment, and be mortgage-free quicker. That’s $956 LESS each month! Make this the start of a new financial life. We’d love to help you crunch some numbers to see what kind of life you could be living! Talk to us about scheduling a free, no-obligation review of your situation. We guarantee you’ll be glad you did. +4.5% current mortgage, 3.5% new mortgage. 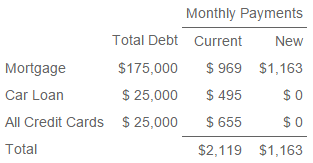 Credit cards 19.5% and car loan 7%, both 5 yr am. Subject to change. OAC. For illustration purposes only.